Part 1 Directory of manufacturers, agents, suppliers and distributors. Part 2 Databook: Thermoset resins; Comprehensive review; Key to tabulated properties; Adhesives; Flowcoats, topcoats and surface coats; Gelcoats and in-mould coatings; Matrix resins for laminating and associated purposes; Thermoset resins for polymer concrete, cultured marble, onyx and associated filled applications; Formulated surfacing pastes, putties and filler pastes; Resin systems; Sundry thermoset resin applications. The continuing expansion world-wide of the composites industry ensures a warm welcome for the second edition of this popular and successful directory and databook, first published in 1993. This edition has been completely revised and updated to include many new companies and new and improved thermoset resin systems, as well as major and important changes in the whole manufacturer/supplier picture. 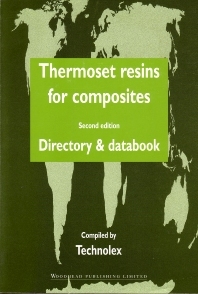 As in the first edition, the initial directory section of the book includes a comprehensive contact listing of all relevant companies, together with some basic explanations of thermoset chemistry. The databook section has been completely redesigned to allow more resin description and property tabulation as well as a more reader-friendly, useful layout. In its new edition, the book will continue to be an essential reference throughout the composites industry as well as to academics and students of materials science.